Antibody-drug conjugates (ADCs) are an emerging area of study within medicinal chemistry and are thought of as sophisticated drug delivery systems due to their specificity to a disease-targeted antigen. ADCs have been actively utilized as therapeutics for hematological and solid tumor cancers due to their capability to deliver a cytotoxic compound to a specific cancer cell without affecting normal cells. An antibody drug conjugate has three major constituents: a monoclonal antibody (mAb), a chemical linker, and a potent cytotoxic payload. 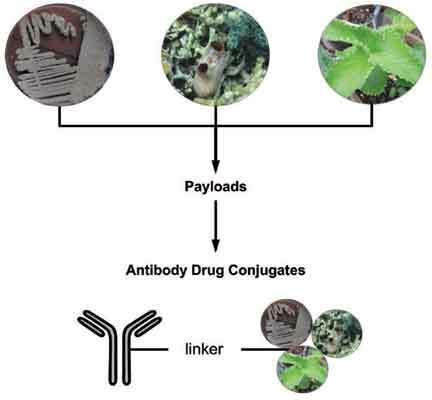 There has been a continuing effort to optimize antibody-drug conjugates, with the primary focus of design and development directed at either the mAb or the chemical linker, with little effort devoted to the optimization of payload compounds. In fact, among the 114 ongoing or recently completed clinical trials, there is generally a lack of diversity in the cytotoxic payloads that are utilized, with only seven payload compounds reported (four additional trials are ongoing with structures that have not been reported). Six of these seven payload compounds are derived from natural product sources, highlighting the importance of natural products as cytotoxic payloads for ADC. Antibody drug conjugate (ADC), Cytotoxic payload, Natural products. Division of Medicinal Chemistry, Department of Pharmaceutical Sciences, School of Pharmacy, University of Connecticut, 69 North Eagleville Road, Unit 3092, Storrs, CT 06269, USA.